Given the India-US strategic relationship and strong business ties between the two countries, US President Barack Obama should care about creating jobs in both Bengaluru and Buffalo and not only the latter, former Nasscom chairman told an American federal body. Testifying before the USITC, Rao referred to the remarks made by Obama a few years ago wherein he had referred to moving jobs from Bengaluru to Buffalo. 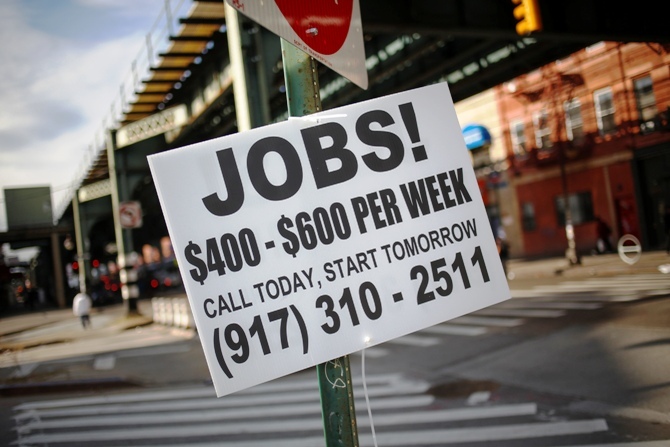 Image: A sign advertising jobs is posted along a street in the Brooklyn borough of New York October 23, 2013. "We believe that, back in 2009, President Obama's speechwriters got it wrong when they wrote that business should be supported in Buffalo rather than Bengaluru," Rao said. Indeed, one month later, the Technology CEO Council released a study revealing that the proposed changes to tax policy would result in a job loss for as many as 2.2 million Americans, he said. Besides affecting jobs, investments in plants, equipment and property in the US could fall by as much as $84.2 billion, according to the report by former Clinton administration economic official Robert J Shapiro and Aparna Mathur, a research fellow at the American Enterprise Institute, he said. "Today, Bengaluru is probably the most pro-American city outside the United States. 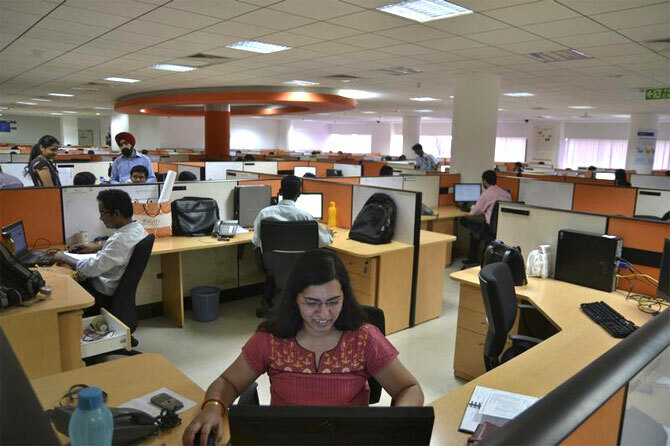 Texas Instruments, HP and many other American-based companies flourish there and are well positioned to take advantage of India's growing needs for IT products and services," Rao argued. 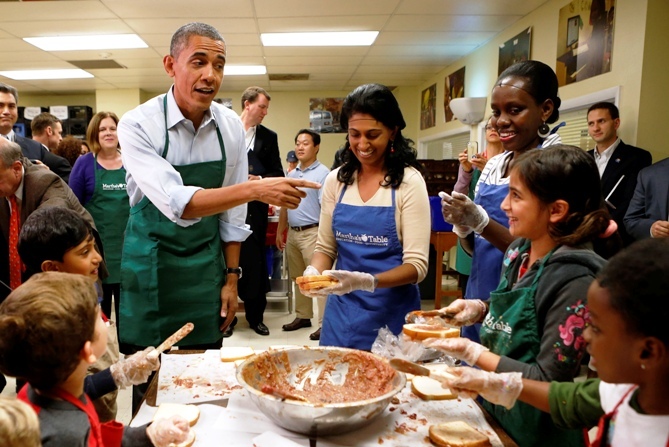 Image: US President Barack Obama greets children and volunteers during a visit to Martha's Table, a kitchen that prepares meals for the needy. "If you visit Bengaluru or Gurgaon, you will see millions of square feet of office space filled with US-branded IT equipment, as well as other imports," he said in his testimony. The fact is, he argued, the US and India's IT sectors have decades of history in mutually beneficial symbiotic relationship benefiting both nations. "Our collaboration has generated a robust knowledge-based economic engine that breeds innovation, growth and job creation. “There is every reason this collaboration should continue," Rao said. "In fact, this week in Mumbai, Nasscom is hosting senior representatives from the US along with Australia, China, Colombia, Germany, Great Britain, Japan, Mexico, Sweden and scores of other countries at the 2014 India Leadership Forum in Mumbai," he said. 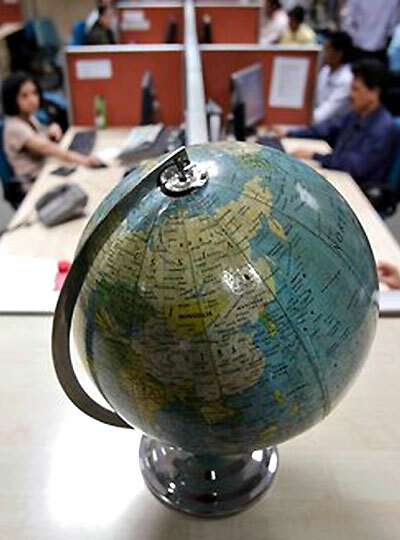 "They are gathering to discuss the uncertainties and complexities of global economics; how mobility, social media and big data support a successful digital enterprise; and how emerging and future technologies will drive the IT-based businesses and economies," Rao said, adding these are concerns and aspirations for business and economic success shared equally by the two countries. "The strategic relationship between the US and India also includes cooperation in cybersecurity, national defence, higher education, clean energy, diabetes and other health issues, low-cost medical technologies; science, space, and many other areas," he said. "Especially in this year of elections for a new government in India and midterm elections in the US, we hope that reason will prevail over rhetoric in both countries so that we can continue to build on these mutually important areas of interest," Rao said. In his testimony, Rao hoped the Congress and the Obama Administration will show patience and restraint. For example, the discriminatory provisions on temporary visas for high skilled workers in Senate Bill 744 and a similar bill introduced in the House of Representatives would seriously disrupt relationships between thousands of US companies and their long-standing IT services partners, many of which are based in India, he said. "This would hurt US businesses, interrupt job growth, and endanger the expanding trade between the US and India. “So we hope that, when Congress resumes consideration of the important subject of immigration reform, there will be bipartisan support for reform that addresses America's growing needs for high-skilled talent in computing and other IT fields; allows US companies to choose their business partners and suppliers; and supports the growing and mutually beneficial trade and commercial relationships between the US and India," Rao said. 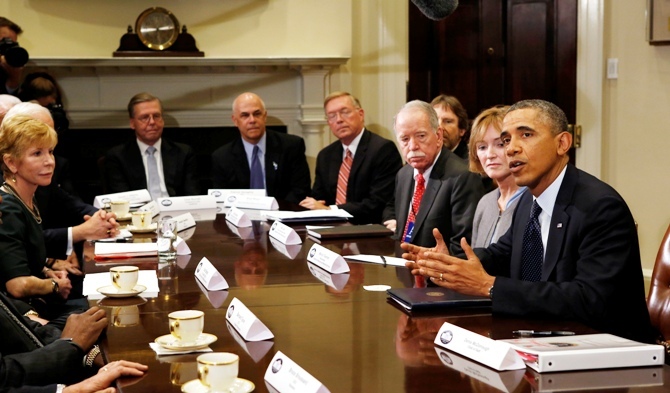 Image: US President Barack Obama meets with health insurance chief executives at the White House in Washington November 15, 2013.